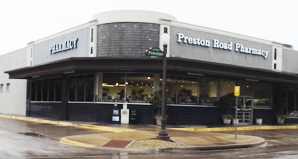 Preston Road's Veteran Delivery Staff will deliver everything you need, from prescriptions and sundries, to gifts for any occasion. Our experienced drivers will bring it to your front door. When you need us, we will be there for you. All it takes is a phone call to 214-521-9991. With our FedEx™ shipping account for those who travel, Preston Road Pharmacy offers shipping for your medications. Just give us a valid address and a form of payment and we can ship medications directly to you.